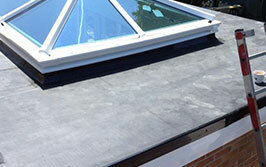 Bailey and Sons are specialists in Flat roof installation, repair and maintenance. With fast and reliable service, all our flat roofs are insulated and fully guaranteed. If not installed properly, a flat roof can cause a number of issues including leaks, blockages of rainwater outlets and more. Bailey and Sons are skilled and experienced in dealing with flat roofs – they will professionally install your roof to ensure these problems don’t happen to you. If your garage roof has undergone damage and is in need of repair or replacement, Bailey and Sons engineers have years of experience to fix any issue you may be faced with. We only use quality materials in our repairs so you can be safe in knowing your roof has been repaired to the highest standard.